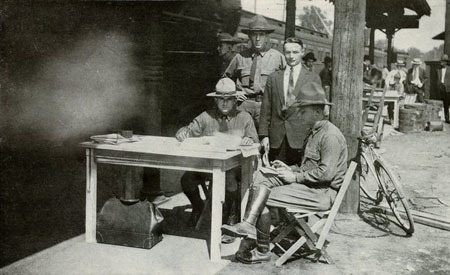 This photograph shows Lieutenant James Laughlin of Cleveland checking in as the first recruit at Camp Sherman during World War I. It is from a souvenir book compiled by Frank Ward, a news correspondent at the camp. The book includes photographs of the camp, a history of Columbus' role in the war, and information on daily life. Camp Sherman, near Chillicothe, Ohio, was built in September 1917 to accommodate 42,000 soldiers. Draftees and enlisted men were trained at the camp before leaving for duty overseas.